CERAMIC PLATE JAPANESE SOMETSUKI SANSUI Blue White Glaze Hand Painted Cobalt. 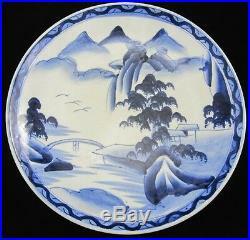 A hand painted Japanese ceramic plate, done in the Sometsuki Sansui style, with cobalt blue over white. We are pleased to present this hand-painted ceramic plate, done in the Sometsuki style, popular from Japan's 19th Century. The most simple coloring technique developed in the earliest time of porcelain industry. Sometsuke refers to the Japanese vitreous porcelain ware which is hand painted in under glazed blue, generally cobalt oxide. This plate measures 12 1/4 inches in diameter and weighs 2 3/4 pounds. This plate was obviously used in the past and has the predictable utensil marks on the surface. Other than that, the plate has no cracks, chips, or crazing. For decoration or use, this plate is a great example of Japanese history and culture! The item "CERAMIC PLATE JAPANESE SOMETSUKI SANSUI Blue White Glaze Hand Painted Cobalt" is in sale since Friday, August 3, 2012. This item is in the category "Pottery & Glass\Pottery & China\China & Dinnerware\Made in Japan".